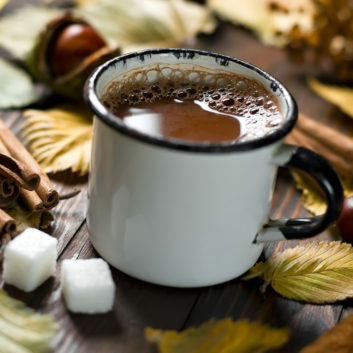 Curl up on the couch with this healthier take on hot cocoa. My lightened up version is made with unsweetened almond milk and dark chocolate chips. It’s a cinch to make and delivers sweet and soothing satisfaction. Whipped cream and chocolate shavings optional! Heat the almond milk in a small saucepan over medium-high heat until the milk is hot and starting to steam, about 5 minutes. Remove the saucepan from the heat. Whisk in the sugar, vanilla, salt and chocolate chips, and continue to whisk until the chocolate is completely melted. Pour the hot cocoa into three mugs. Top each mug with a squirt of whipped cream and dark chocolate shavings if desired. If you love warm beverages, try this Peppermint Hot Cocoa!